Hello esteem Leaders and readers, I am here today to encourage you to be more zealous in the service of God! Please just give me a little of your precious time! please do not take this blessed moment as a waste of time, I called it blessed because I know that by the time you are done reading and pondering on this Rhema, you will be change in one way or the other because something valuable will be drop in your spirit through the power of the most high God, The Prince of Peace! A lot of people receive query in their place of work because of negligence of duty, sometimes most of these query may even leads to termination of appointment, and personally I do not call it “Letter of Query” but “Love Letter” because it will make you wake up from your slumber. But God is not like a man, He is a God of a second chance; please do not use the grace of God in vain! 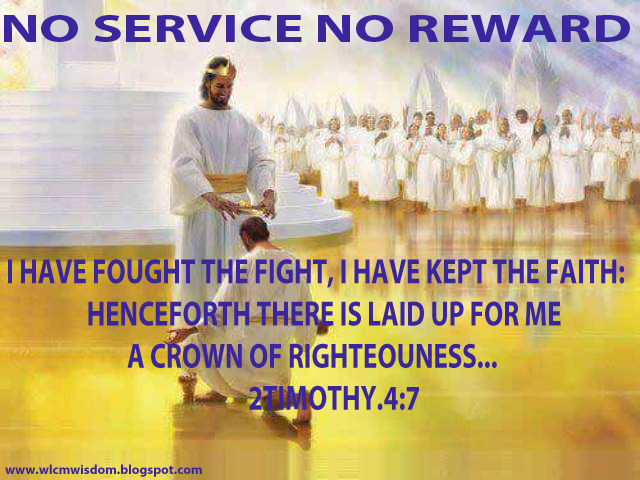 Be zealous in His service! Serve God with passion, with humility and in sincerity, serve him with your spirit soul and body, let everything about you speaks about God, your conversation as couples, family, friends, colleagues, ministers, students, represent Christ in your daily activities, let him the reason you live. As we are all celebrating and rejoice over the birth of Jesus, the prince of peace let that joy envelop you to do things joyfully and peaceably that will make people to say, I can see the Light of God in her/him and I want that light to be in me too! Take a very good look at yourself, your services to God from January till now, be sincere and let your conscience be your witness, can you boldly say, yes! Lord I’ve really work in your vineyard and I deserve all these things that am enjoying, I’ve win souls, spread the good news. Let me tell you this please, you do not have to go from street to street to spread the gospel of Christ, just take a look at your environment, workplace, people close to you, just look deep a little you will see them, start from there, let go that attitude of “please mind your own business” show love to people around you, a little kindness can bring a very big change, it can be a turning point in the life of that person, you do not have any idea of how many souls are waiting to be saved by you through the power in the name of Jesus. What are you doing? Wait a minute! Did you just say, I would have loved to but there is no time? Hmm…am always so busy! Busy doing what? Wait, you think you a business man/woman, a career woman, a working class? Fine! Since that you’ve been busy working, are you using those income to buy the air you are breathing, you are working like an elephant and eat like an ant, what a shame! You are busy traveling up and down, exploring countries, states; you even want to go to the Mars, just that you are afraid to die! Traveling is good, but when it is not adding value to your soul salvation is worthless, on that judgment day, beloved the numbers of places you have traveled to will not be ask, even all the titles you’ve received won’t be recognized, so you see all these things are vanity upon vanity. Is God that gives power to make wealth, acknowledge the source, the giver of power to make wealth, He knows all your needs. But you have to embrace Him deeply, love Him by loving the people around you, release people from your heart, that why you are having heart pains every now and then, you are busy planning on how to revenge, instead of meditating on the word of God, don’t let your character make people say I’ll rather remain an unbeliever than be being a believer and behaves like that sister or brother, Oh! you are saying what’s my business, how does it concerns me if he/she repent or not, Am saying is your concerns, beloved please represent Christ well, for whatever things you are doing , your reward is there, that’s very sure! Let us hear the conclusion of the whole matter: Fear God, and keep his commandments: for this is the whole duty of man. Ecclesiastes 12:13. You need to keep your appoint with God, that’s when you spiritually progam your daily activities, and deactivate the programs of the prince of this world. taking full authority and prophesy into the atmosphere, so that when you are out there and people are panic and saying there is a casting down, the Spirit of God will raise a standard for you and you will say there is a lifting up. Let me tell you, the solution for every life pressing problem is in the Word of God! There is breakthrough, deliverance, power, prosperity, success, fruitfulness, healing, good health and life. You see, is all there, just give Him a chance. You know you’ve not done well in 2015. You can’t deceive yourself, you know that! Forget about what people are saying, please don’t let those words from the kingdom of darkness disconnect you from the service of God. Ignore them and do that which is pleasing in the sight of God and with a perfect heart. Remember Jesus said, let the wheat and tares grows together till the day of harvest, Matthew 13:30, that why He also said; these things I have spoken unto you, that in me ye might have peace. In the world ye shall have tribulation: but be of good cheers; I have overcome the world. John 16:33. Just keep doing the right thing when they are done and can’t succeed in weighing you down because of the Grace of God in you, they have no choice than to bow to the sovereignty of God! Praise God! As you are victoriously marching into 2016, walking into your "Divine Inheritance" serve God with Fire. Whatsoever may stand in your way as a stumbling block, crush them down and march on with the name that is above all names! Jesus! Be filled with joy and with Holy Ghost to serve God in 2016, but watch thou in all things, endure afflictions, do the work of an evangelist, make full proof of thy ministry, Amen! Thank you so much for your precious time, I really appreciate it, and i believe the Spirit of God is communicating with your spirit right now, just be still and listen! See you at the top in 2016!!! I love you all stay blessed! There is no greater joy than the joy derived from genuine service to God. Thank you Gloria...for this Bible portion, it really gives more Light. Stay blessed! *smiles* see you dear at the top in 2016! Am glad you stop by...indeed it pays to serve the Lord! Hallelujah! The point where you said, "don't rush" really spoke to me. It is easy to rush when we are before God but that is not right. We should take time, be still in His presence and have a heart to heart conversation with Him. It really pays to serve Jesus and service for the Lord is the sweetest service ever. Thanks for such an edifying post, Lucy. Thank you Precious for reading and for your wonderful contributions! I appreciate!!! Stay blessed! A very thunderous Amen Chi love!! I love you! Stay blessed! Happy last day of the year. Thank you Love! same to your, Yes if not for His Grace where would we have been! Grace has brought us through! Thank you Gloria for your love and Assistant! You've been a sister and a friend! I love you! It pays to serve God. I want to serve him better in 2016, so help me God. See you in 2016 Lucy. God Bless you Pam dear for visiting us today, see you in 2016! *smiles* God bless you for your love and commitment towards Him! Amen! There is no regrets for those who serve the Lord. he always come through for them.